A draft of the Every Student Succeeds Act (ESSA) state plan was presented to the Illinois State Board of Education at its meeting on Aug. 25. The draft is available online. A guide to the state ESSA plan is available here. 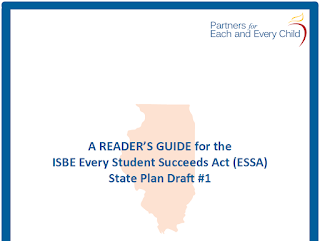 A reader’s guide has also been made available to help everyone better understand and form questions regarding the draft state plan for implementing this new federal ESSA law. The draft provides information on accountability, assessments, and the statewide system of support, among other topics, for all schools. Included are a number of questions for school leaders to use to give ISBE additional insights. The state is encouraging school leaders to read the plan and share ideas, critiques, and potential solutions. When submitting comments, officials ask, please include the name of the responding individual and/or organization, and the pertinent section number, plus the page number referencing the state plan. All such comments may be submitted to essa@isbe.net through Oct. 7. ISBE recently added an October date to the ongoing second round of listening tour meetings it is hosting, with the assistance of Regional Offices of Education, for gathering feedback on ESSA. These meetings are being held across the state to provide overview information on the federal law and allow participants to share their ideas on the draft state plan for implementing the law. The additional meeting will be held on Oct. 5 at the DeKalb County Farm Bureau, Farm Bureau Theatre, 1350 W. Prairie Dr., Sycamore. For more information and to download a detailed schedule, visit this site. State officials say school districts should soon arrange to access ISBE training for their teachers and school readiness coordinators on using the Kindergarten Individual Developmental Survey—or KIDS. 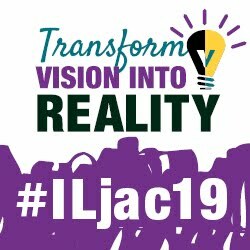 This research-based observational tool has been developed for Illinois educators to collect school readiness information. All school districts will need to report to ISBE on 14 state readiness measures for each kindergartner, beginning in the fall of 2017-2018. Data on each kindergarten student, based on local instruction and assessment practices, will be reported through the KIDS-Tech rating system. There will be only one data collection period. Districts looking to continue their use of KIDS to monitor student progress and growth may keep on collecting and entering data during the winter and spring, but data sharing will not be required statewide until 2017-2018. Officials suggest districts begin soon to arrange to train teachers on KIDS. Online and in-person training is available through ISBE for school readiness coordinators, teachers, and administrators throughout the state. To get more specific information, or to contact someone at ISBE about KIDS or school readiness, e-mail kids@isbe.net. Additional information is available on the ISBE and KIDS websites.